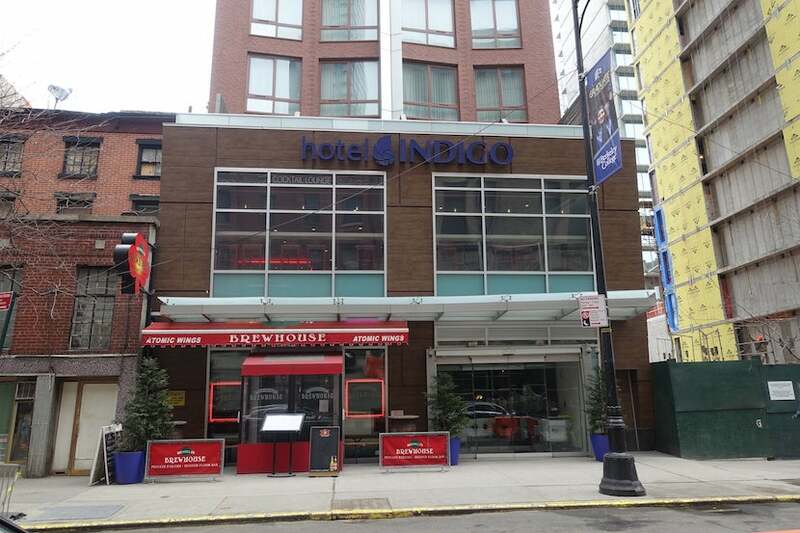 A recent trip to New York City proved the perfect opportunity to maximize IHG Rewards’ Accelerate promotion with a one-night stay at the Hotel Indigo Brooklyn. The pros: low rates, great location, friendly staff. Cons: loud construction noise that came without warning. On a recent trip from Los Angeles to Europe, I had a one-night layover in New York City before I would catch my connecting flight to Madrid. That left me looking for hotels with low rates where I could maximize my points earning potential. Luckily, I soon received the details of an IHG Rewards Accelerate promotional offer and found I could rake in tens of thousands of bonus points with just a single-night stay. As soon as I saw these, I knew it was time to explore my options with IHG, especially since it would fulfill several requirements on the list. Plus, it’d be midweek stay and rates at the dozens of IHG properties in and around the city were pretty decent, ranging from $120 to $250. 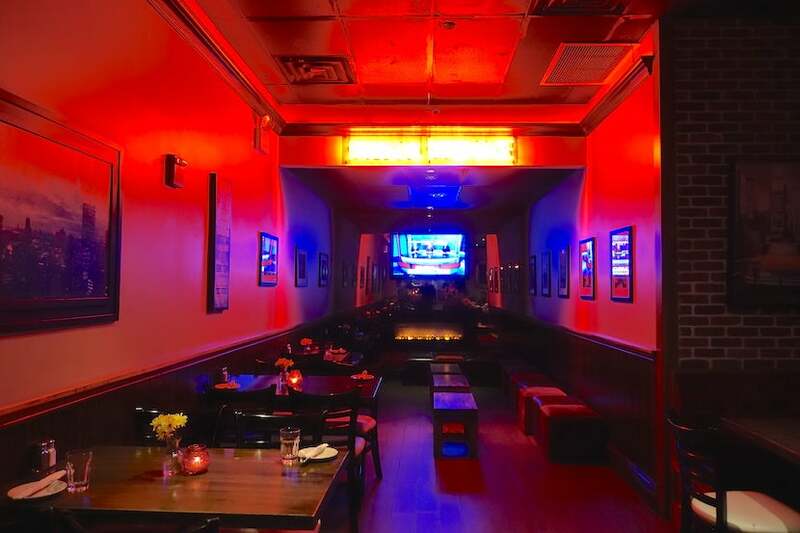 I wanted to get the biggest bang for my buck while also checking out a new city, not to mention my flight would be arriving at LaGuardia Airport (LGA) and departing from John F. Kennedy International Airport (JFK) the following day, so I figured I would stay in Brooklyn since it’s close to both airports. 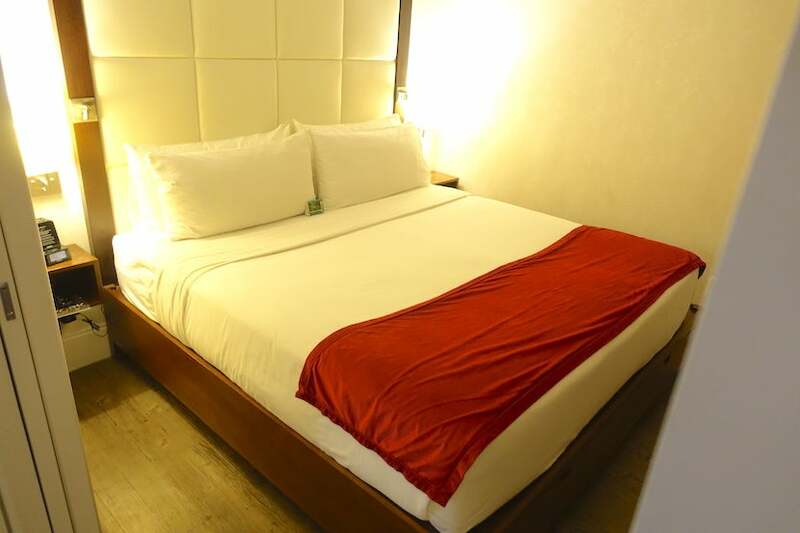 I like Hotel Indigo brand because it’s a bit fresher and more chic than some of IHG’s other hotels, yet still something of a bargain — I booked the starting room category, a “Queen Bed Leisure” room for $143 for the night. 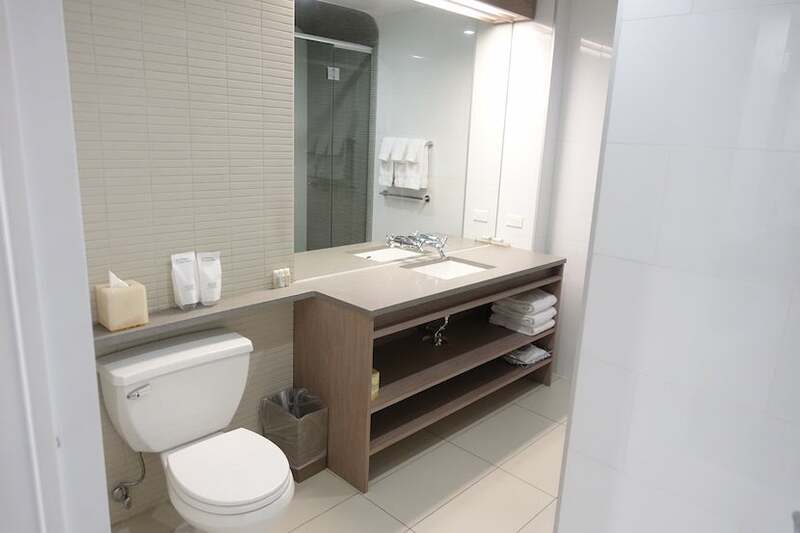 Just for reference, the same room would have cost 40,000 IHG Rewards points if I’d booked it as an award stay, giving it an abysmal 0.35 cent-per-point value as per TPG’s latest valuations. About 72 hours before check-in, I looked on my IHG app and noticed I’d been upgraded to a one-bedroom “Executive King Suite,” which usually goes for $130-$300 more per night (depending on when you book). Score! All told, I spent $143 and ended up earning 33,145 IHG Rewards points, since my stay counted toward every Accelerate promotion except the five-night one. That’s like paying 0.43 cents per point. I arrived at the hotel (in Downtown Brooklyn) around 10:00pm after a 20-minute drive from LGA. Both the street and surrounding neighborhood were pretty quiet. There are a few other hotels on Duffield Street, including an Aloft and a Sheraton, and I almost didn’t spot Hotel Indigo because it’s in such a small building. The Hotel Indigo Brooklyn was hard to spot from among the other nearby buildings. The hotel is 19 stories high, with 128 rooms and suites. The lobby is tiny, with just two reception desks, a small sitting area, a magazine rack and this installation of metal beads running from the floor to the ceiling two stories up. The lobby at Hotel Indigo Brooklyn. The check-in process was very quick. I presented my ID and IHG Rewards Club Credit Card — didn’t want to forget that or I wouldn’t be able to fulfill my IHG Accelerate promo terms! The reception agent told me where to find the hotel’s restaurant and bar, though the bar, which is on the second floor, was unmanned. 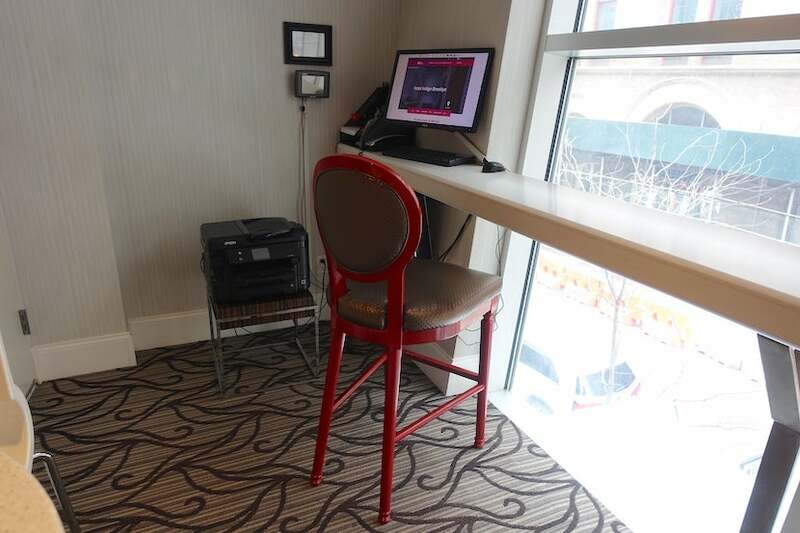 He also said there was a printer I could use on the second floor, as well as a fitness center and a rooftop terrace on the 19th floor with nice views, although it was a bit cold outside. Then he handed over the keys and sent me up the elevator. There were only a few rooms on my floor and just two on my side of the elevator bank. The first thing you’ll see when you open the door is the living room area. I was upgraded to a suite. 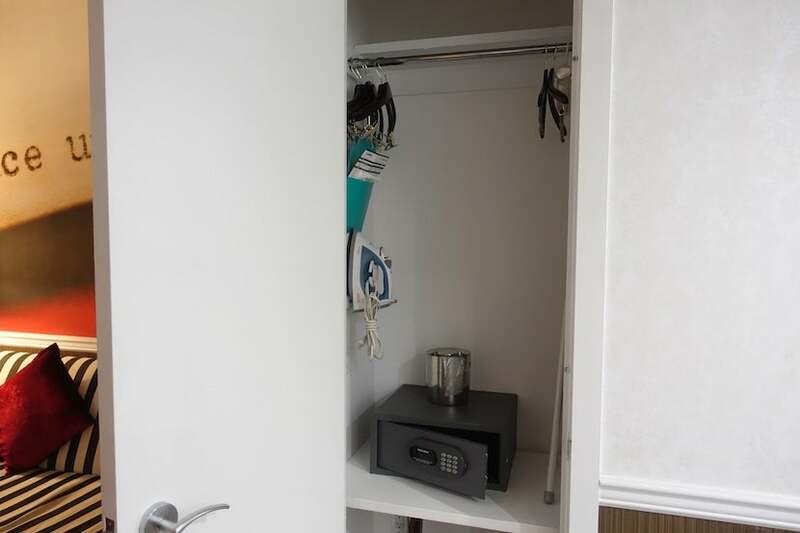 Not a very large closet or safe. …and a desk. Wi-Fi at the hotel is free for all guests. The desk (at right) and kitchenette. A large, but sort of worn-looking sofa bed sat next to the floor-to-ceiling windows, across from which was a 40-inch wall-mounted television. 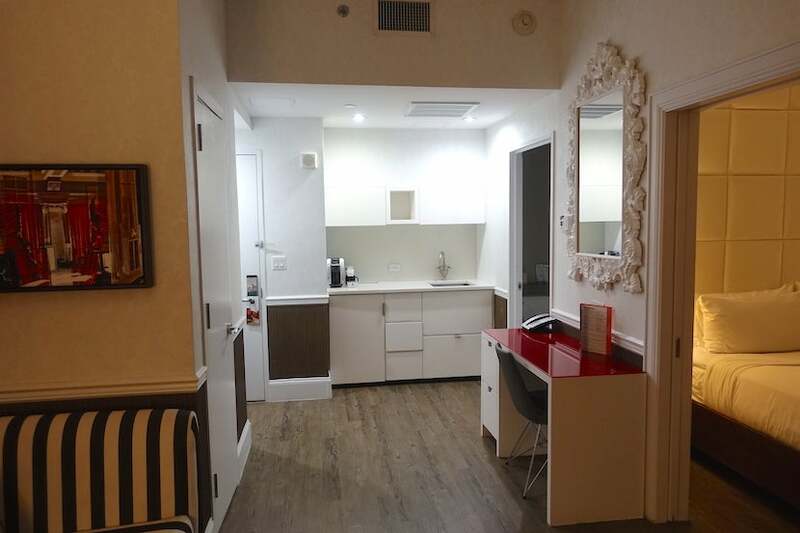 To the left of the door was a kitchenette area with a sink, a coffee maker and a mini-fridge, pictured above. Just beyond that was the bathroom. The bathroom was slightly… severe. 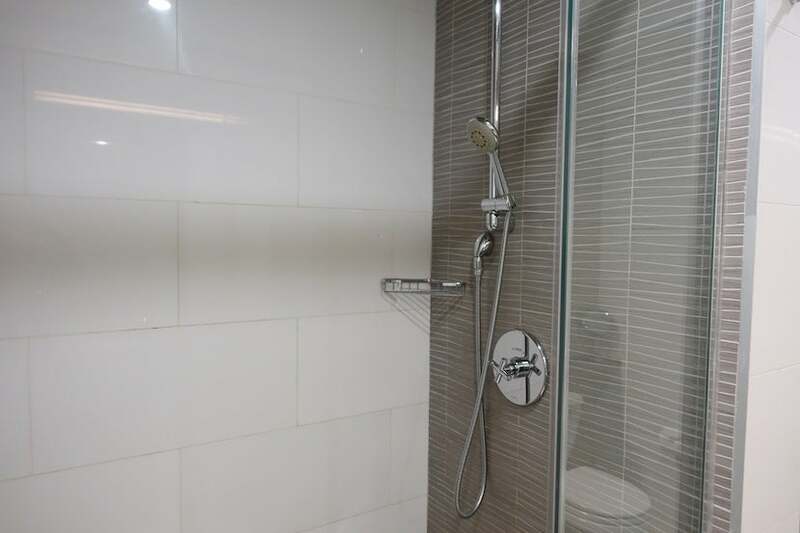 The bathroom was a bit stark, if you ask me, with white and gray tile, a single sink and a shower. 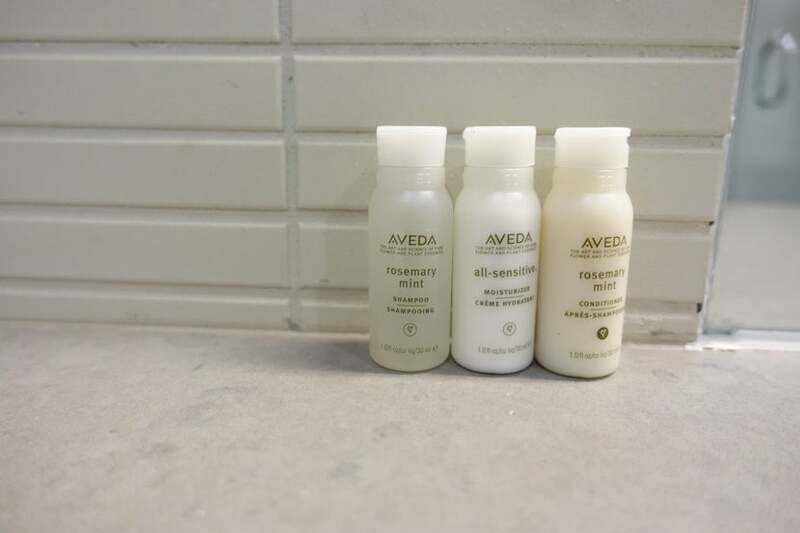 The shampoo, conditioner and lotion amenities were from Aveda. Aveda shampoo, conditioner and moisturizer. Back in the living room, there were double sliding doors that opened into the bedroom. Inside was the king-size bed with a wood-and-white-leather headboard. On either side of it was a nightstand, a regular wall-mounted lamp and a small reading light. Looking from the living room into the bedroom. The bedroom also had a desk with drawers and a second wall-mounted television, though this one didn’t work because there was an issue with the cable box. The bed was really comfortable, as were the feather pillows. The king-size bed was very comfortable. 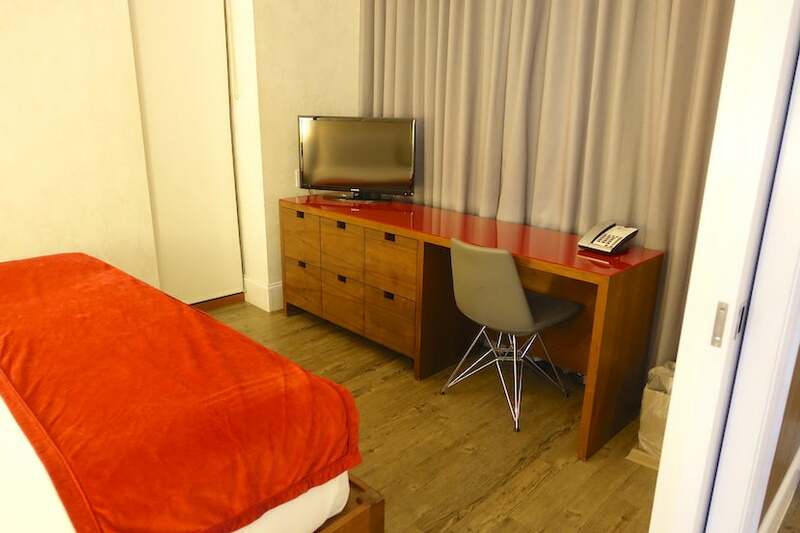 Overall, I liked the colorful palette of the room, a nice change from the drab beiges, browns and grays most hotel rooms seem to be outfitted with these days. There was another desk and (non-working) TV in the bedroom. And now for the bad part of my stay. I was pretty tired after my day of travel and looking forward to a good night’s sleep — I even had earplugs and an eye mask on. 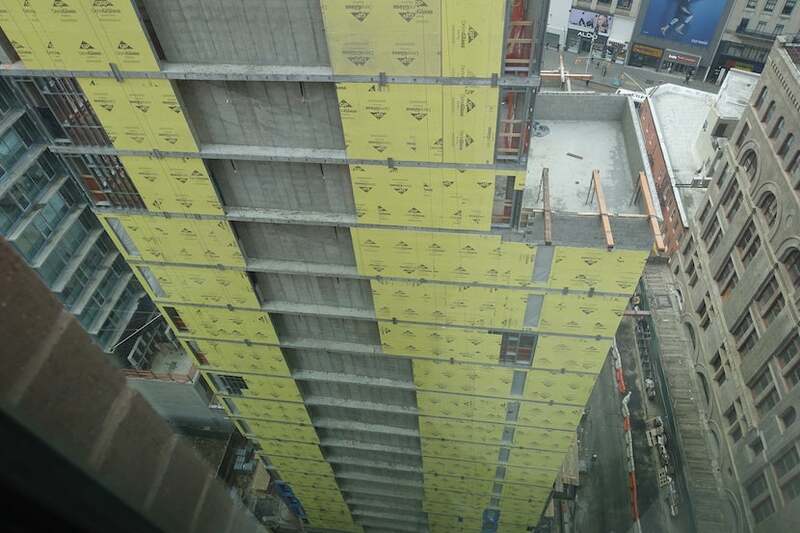 Unfortunately, I was out cold for most of the night but woke up with a start around 6:15am because of the tremendous amount of noise coming from… the construction site right next to the hotel! This is what woke me up at 6:15am. That’s right, they’re building another tower just next door to the Hotel Indigo, and I hadn’t seen it because my shades and curtains had already been drawn the night before. Not only that, but the man who checked me in hadn’t mentioned anything. If he had, I would have opted for another room. Now, I understand that noise is part of hotel living, but this was on a whole other level — as I mentioned, I was startled awake even with earplugs! I had to deal with the noise of construction trucks coming and going, jackhammers, drills, saws and whatever else goes on at a NYC construction site, all of which continued unabated until I checked out that afternoon. I would have taken a smaller room if it meant being on the other, quieter side of the building. When I mentioned this at check-out, the receptionist was apologetic but didn’t offer anything in the form of compensation for my trouble. I didn’t ask for anything either; I just said I was disappointed in my stay. I was thinking of writing to IHG or the hotel manager about it, but a few hours later, I got an email from the hotel’s guest services manager apologizing for my experience. She had also proactively credited my IHG Rewards account with 10,000 bonus points. I appreciated her initiative and thought it was a nice, appropriate gesture given the situation. 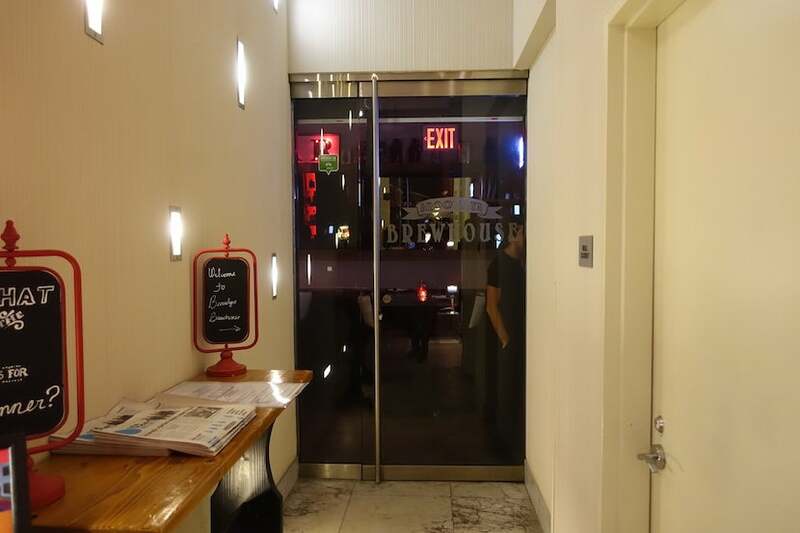 As I mentioned, I got in late, but I hadn’t had much to eat, so I decided to go for a quick, light dinner at the hotel’s associated restaurant, the Brooklyn Brewhouse, which has an entrance on the street as well as in the lobby. There was an entrance to the restaurant through the hotel lobby. The menu featured pub grub, including burgers, flatbread pizzas, salads and appetizers. It was pretty empty that evening. 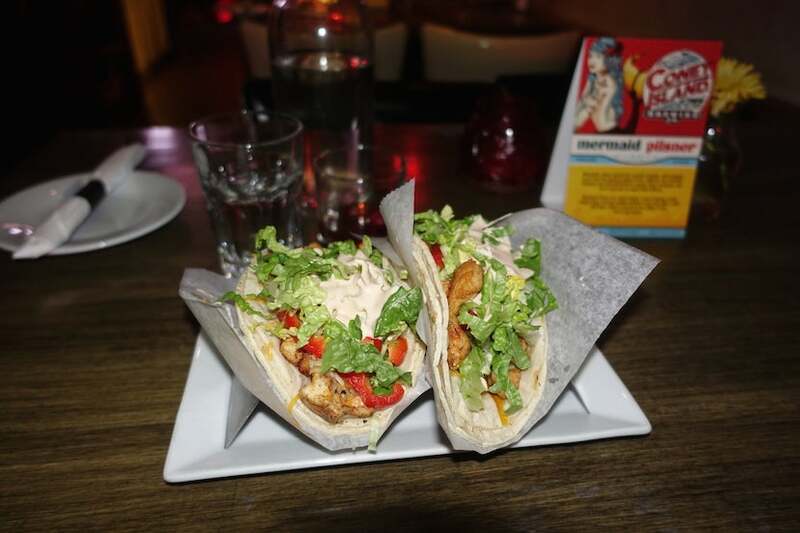 I opted for some grilled chicken tacos, which were light and tasty, if a bit salty and drenched in aioli, which I simply scraped off. The staff were really diligent and friendly. The tacos seemed like a nice, healthy choice. 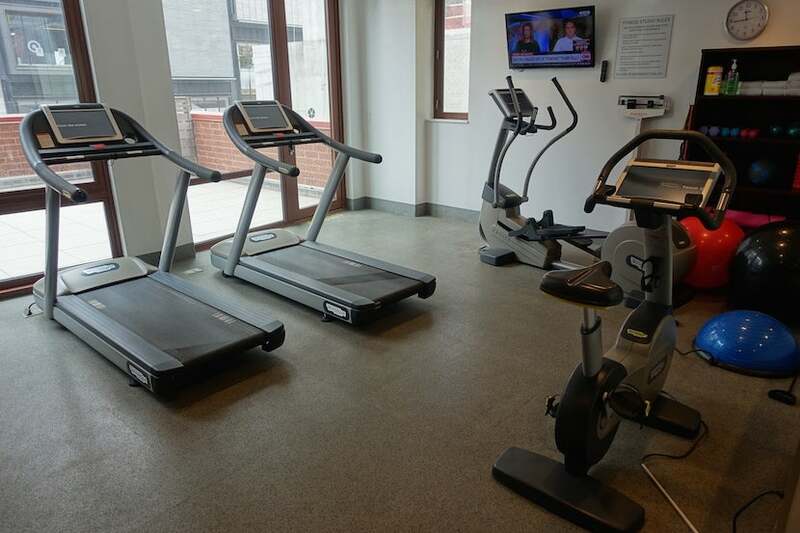 I used the second-floor fitness center the following morning. It was small with only cardiovascular machines, exercise balls and some stretching equipment. 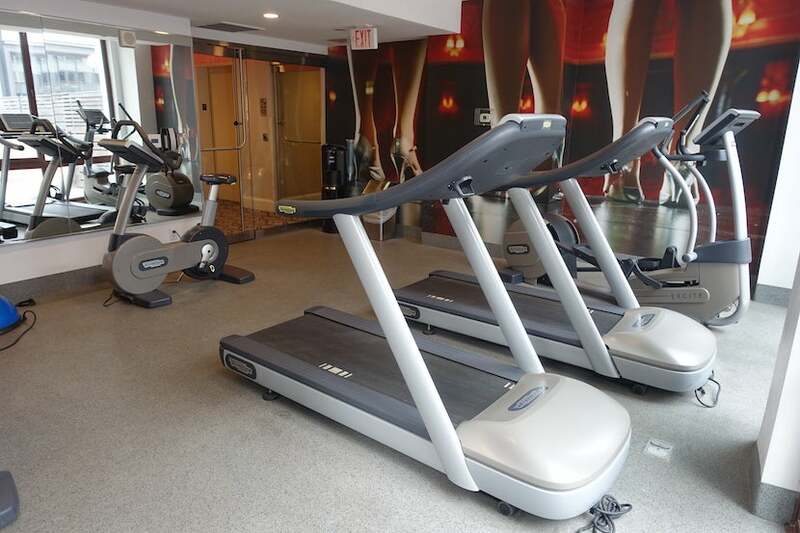 The fitness center was small and only had cardio equipment. Other than that, the hotel doesn’t have too many amenities to speak of. The building’s in a great area close to several subway lines and right around the corner from the Fulton Street Mall, which has tons of shops. Natural light bathed the equipment in the fitness room. One more quick thing to note: Though the hotel’s website says it allows one pet of 25 pounds or smaller per room for a non-refundable $75 fee due at check-in, when you actually check in, the fee is listed as $250, so if you plan to bring an animal with you, be sure to double-check the rate (and maybe even print out the page from the hotel’s website) before you arrive. 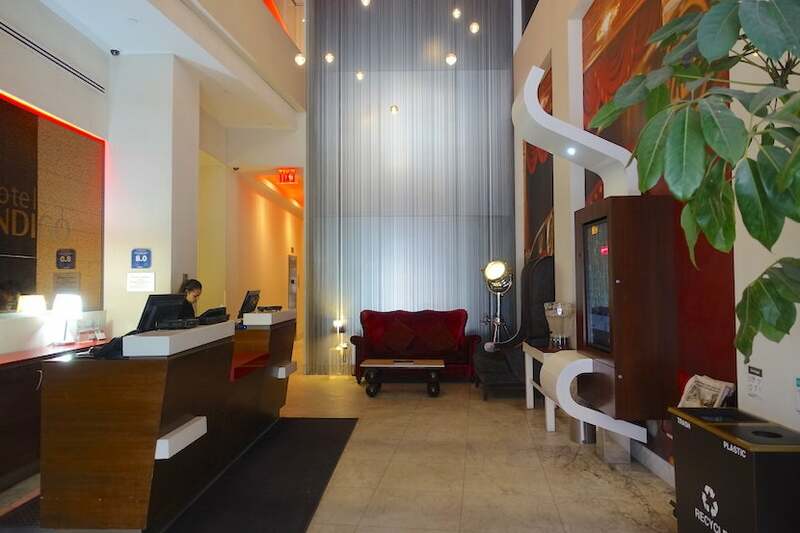 At first glance, Hotel Indigo Brooklyn was everything I needed for my one-night New York City stay. 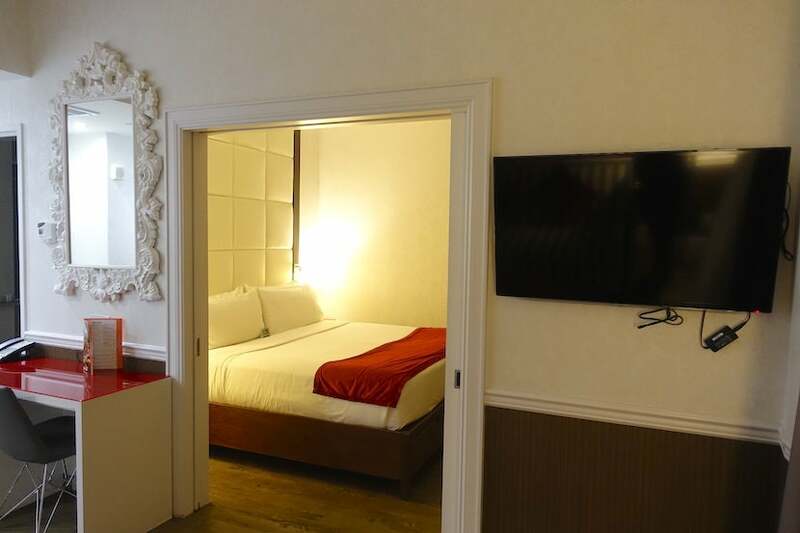 It was inexpensive, convenient for where I needed to be and it would net me more than 33,000 bonus points — plus, I ended up scoring an upgrade to a suite because of my IHG Rewards status. 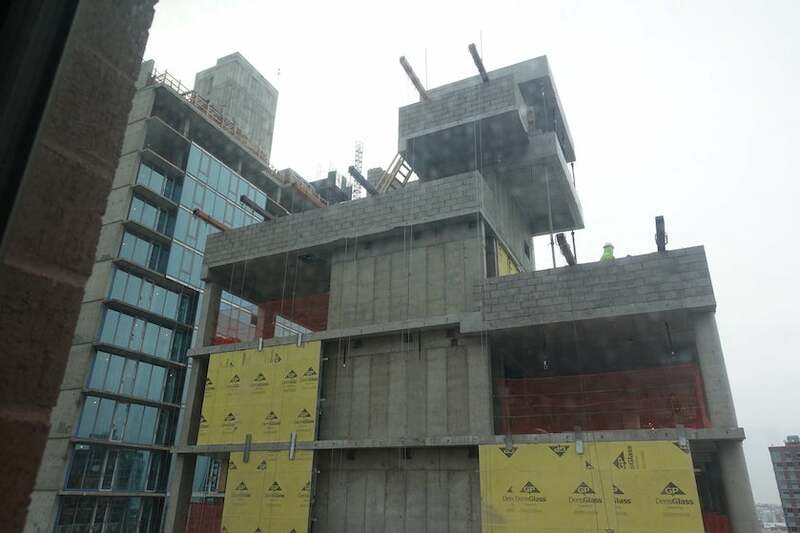 Unfortunately, because of all the construction going on next door, I only got a few hours of sleep and left the hotel feeling tired and upset. I won’t be going back until the construction is finished! 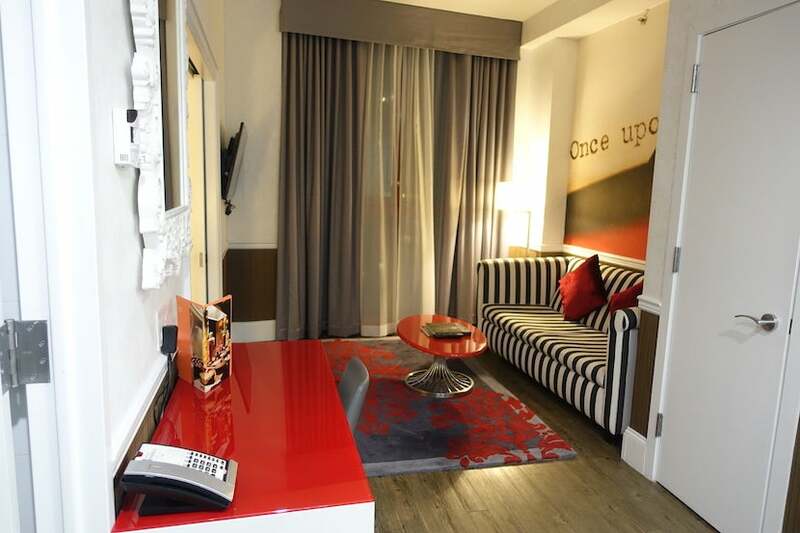 Have you stayed at Hotel Indigo Brooklyn? Tell us about your experience, below.